The Karnataka multi-stakeholder platform for water (Karnataka MSP-water) was launched in Bengaluru on Tuesday. Karnataka today faces a shortage of 950 tmc (one thousand million cubic feet) of water. Population growth and urbanization are projected to widen the urban water demand-supply gap from 24% in 2011 to 58% in 2030. Within the industrial sector, water demand is expected to triple by 2030, with half the additional demand coming from the power sector. 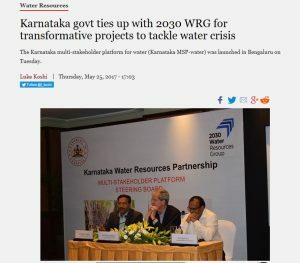 Looking at this scenario, in a unique initiative, the state government has entered into an agreement with the 2030 Water Resources Group (WRG) to bring about large-scale transformation in water resources management. The 2030 WRG is a public-private-civil society collaboration, launched in 2008. Its mission is to help countries achieve water security by 2030, by facilitating collective action on water by involving the government, private sector and civil society. To this end, the Karnataka multi-stakeholder platform for water (Karnataka MSP-water) was launched in Bengaluru on Tuesday, with representatives from public sector, private sector and civil society. The steering board, which will be the apex body overseeing work, will have less than 50% seats reserved for the government. It will consist of multiple work streams, sub-divided into task forces. The three key focus areas of the partnership are: innovative financing and implementation models to promote drip irrigation for the state’s sugarcane farmers in collaboration with sugar mills, financial institutions and the farming community; providing market linkages between the farming community and agri-business community; and promotion of the re-use of treated urban wastewater, through a policy framework and the establishment of a Resource Centre. Arvind Galagally of the KLE Technical University said that there is a competing use of resources with diversification of industries in rural and urban areas and diversification in the needs and use of water. With the rains becoming erratic and due to various factors like climate change and global warming, supply is diminishing rapidly. “On the administration side, there are multiple stakeholders and to bring them under one umbrella was the objective. The WRG 2030 group has been instrumental in bringing together all these bodies for efficient use of available water resources, particularly in agriculture, which uses up to 85% of water,” he said. Flow irrigation being currently used in agriculture leads to wastage of water and ill health of soil. A suitable alternative is drip irrigation whose efficiency is 85% to 90% as compared to 40-45% for flow irrigation, he added. The drip irrigation project in Ramthal started off as a pilot project covering 24,000 hectares and is now ready to be scaled up with more than 15,000 farmers already covered under this scheme. We involve the farmers right from concept to commissioning and encourage them to change from low value to high value crops, Galagally said. “Ramthal is the largest community-driven drip irrigation system in the world today,” he added. “How to scale up pilot projects is the key, especially to get through regulatory barriers, financial barriers and we need to generate solutions. We want to transform the sector,” he added.